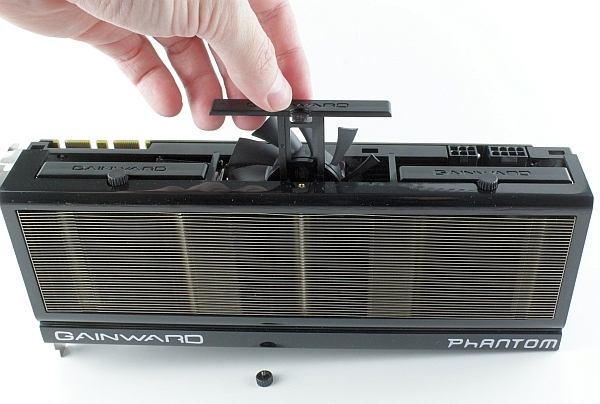 In order to keep the overclocked GPU temperatures at bay, Gainward decided to use the Phantom cooler with a rather hefty heatsink. While Nvidia's reference cooler is quite good, Gainward certainly has a lot of confidence in its own version, but who would not knowing that this is a 2.5-slot wide cooler. However the width of the GTX 780 Phantom card may be its main disadvantage when it comes to enthusiasts prone to building three-way or four-way SLI systems. The Phantom cooler is definitely a looker. We already had a chance to get acquainted with the new redesigned Phantom cooler. We saw it on Gainward’s GTX 770 Phantom where it manages to provide good cooling performance while generating low noise. 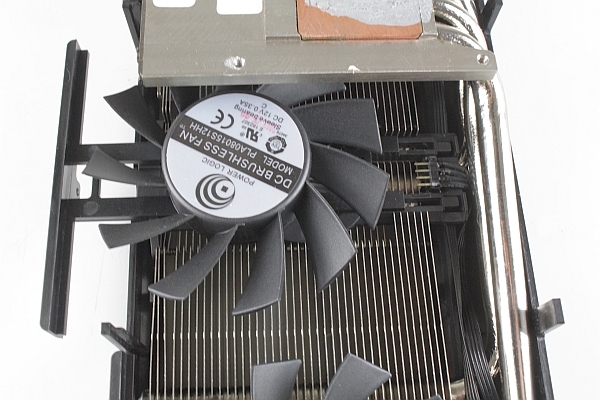 The Phantom’s fans are hidden behind the heatsink so it may trick users into thinking that it’s a passive cooler. Still, if you peek through the heatsink fins, you’ll see silhouettes of the three fans. Note that the GTX 580 Phantom used three fans, but the GTX 680/670 Phantom used two fans. It seems that Gainward decided three fans were a better combination with the redesigned heatsink. 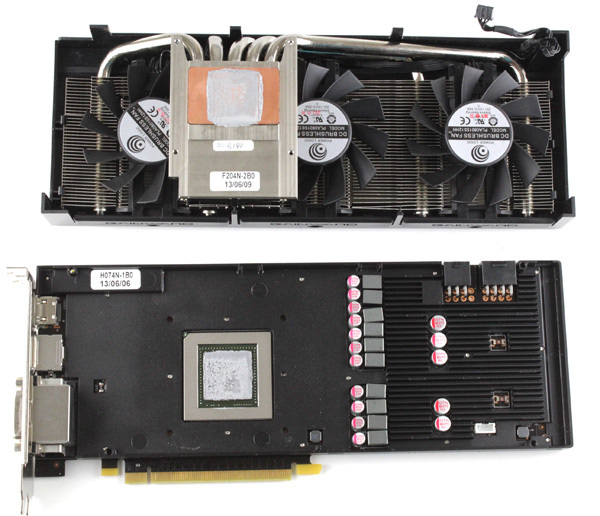 After all, the TDP difference between the GTX 680 and GTX 780 is 55W, which might explain the decision. Now for the clever fan trick we mentioned earlier in the review. 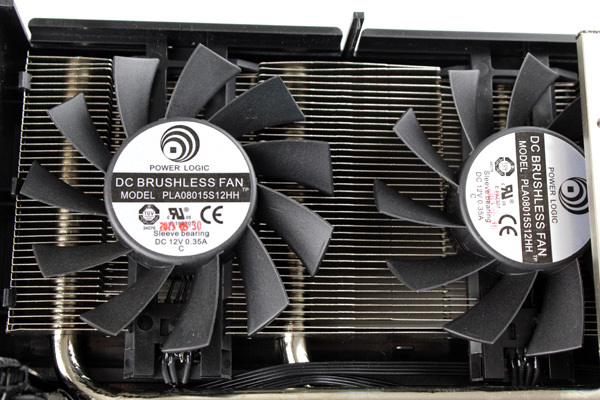 The fans can be removed without removing the heatsink or messing with the wiring. You just need to undo a single screw and yank the fan out. It is a very elegant little trick. The trick is in the integrated power connector inside the bay. You can’t fit the fan upside down as it uses a set of rails to guide it down to the connector. 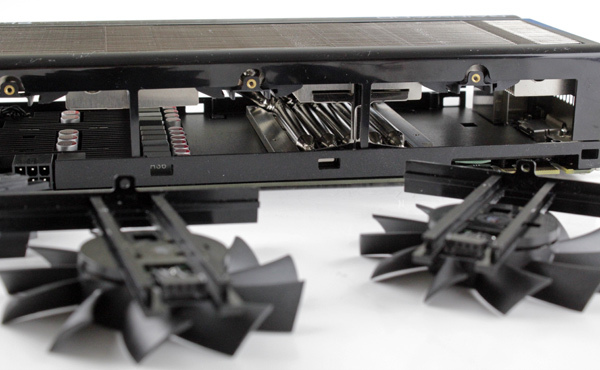 Three fans and a tons of fins attract a lot of dust, hence we really like this approach, as it makes cleaning the heatsink much easier. Gainward uses Power Logic PLA8015S12HH fans with a maximum speed of about 2,900RPM. The same Power Logic fan was used in the GTX 770/680/670/660/580 Phantom cards. If you decide to take the fan off it will void the warranty on most card. However, on the Phantom it won’t, and it makes maintenance much easier. Removing the whole cooler from the card will be an easy task too, and could be done by removing four spring-loaded screws from the card’s back side, but this will void the warranty. Judging by past experience, the loudness of the Power Logic fans depends on the efficiency of the heatsink. A well designed heatsink makes their life easier, and the decision to use three fans should result in more airflow at lower RPMs. Aside from the GPU, the fans are in charge of cooling hot components on the PCB too, and on a 250W card there is no shortage of such components. The next pictures shows how cable routing was implemented. All three fans share the same 4-pin power connector. Setting the RPM manually is a breeze using Gainward’s ExperTool or any other popular utility like MSI Afterburner or PrecisionX. 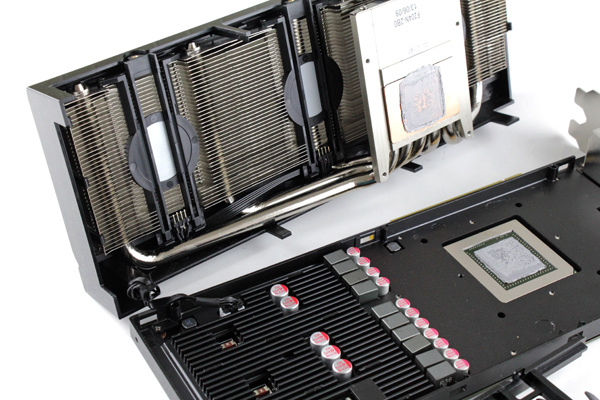 The new Phantom cooler employs a five-heatpipe system to transfer heat between the cooler base and the heatsink. The 8mm heatpipes are curved a bit better than in previous Phantom coolers, so they don’t protrude from the cooler at any point. The welds between heatpipes and aluminum fins are accurate and look like they’ve been done very well indeed. The GTX 670 Phantom did not feature a copper base, as it was made solely from aluminium. That was probably one of the main reasons it did not end up quieter than the reference GTX 670 cooler. 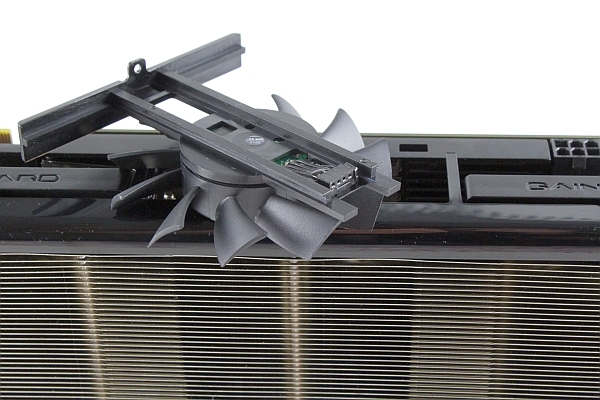 Gainward went back to a copper base with the GTX 780/770, employing heatpipes to connect it to a massive array of fins.